Wonderful day at Double L Tack Shop with Harry deLeyer and the presence of Snowman watching over us all. Harry deLeyer is a wonderful, inspirational man, moving many who met him to tears. When told how great he is, he repeatedly said, "Not me. I am just very lucky. And so thankful!" Photos are posted on my Facebook page "Lori's Horse Portraits" in groups. Please feel free to copy/download your own photo as a memento of this fantastic and fun day! 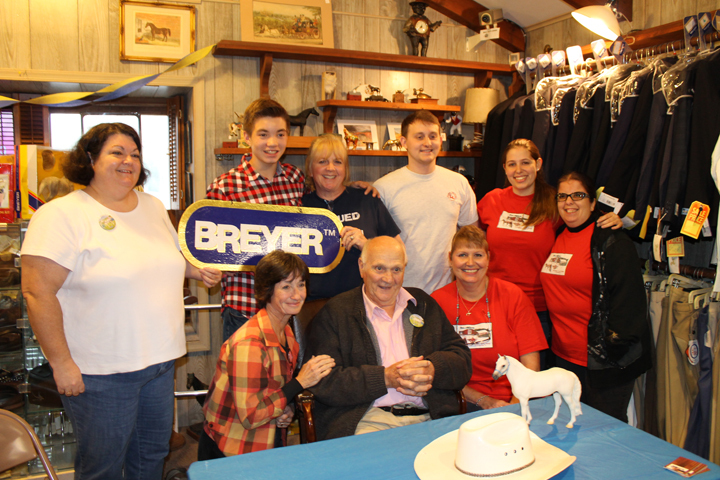 And thanks to Susan O'Neal at Double L Tack Shop for hosting this terrific event! And of course, thank you to Mr. deLeyer for coming and being our hero. p.s. Check the photo on page 162 of the book "The Eighty-Dollar Champion" by Elizabeth Letts. It's Mr. deLeyer's favorite! Rimer is a beautiful, talented and kind Hanoverian Gelding who is very special, not only in his own right, but because he's a brother to my Hanoverian mare. Both horses have incredible presence and compassion, as well as extraordinary raw talent. Rhimer is a champion, through and through! I loved creating this image. His expressive eye was a marvelous challenge. People love their horses, whether they prefer Western or English, dressage, hunting, jumping, driving, trail riding, or showing in hand, the passion is the same. The connection with our strong and patient friends soothes the soul, and brings the world into a better focus. It's been often said that the outside of a horse is good for the inside of a person. Horse Portraits are a way to immortalize this passion and friendship in a time honored manner that is both elegant and profound. My hope is to allow people to own a hand painted portrait of their beloved mount that is beautiful and timeless. 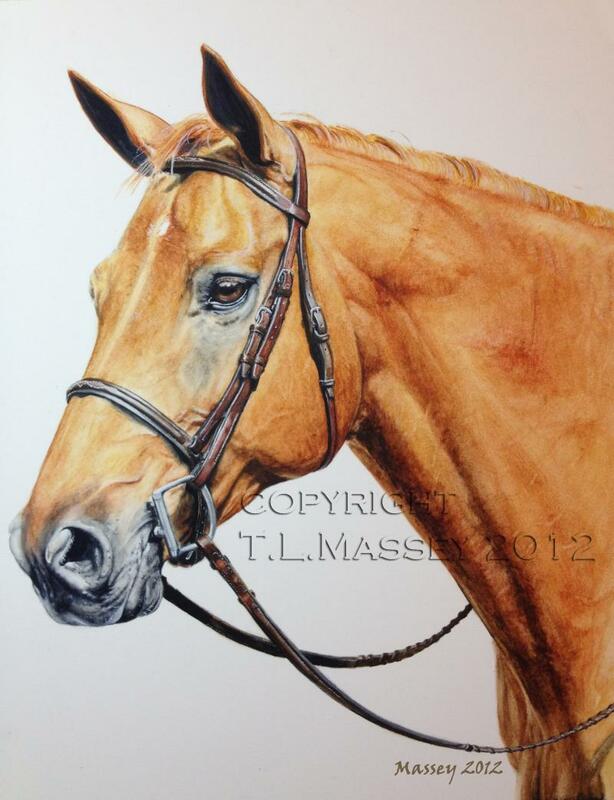 From your digital or printed photos, I can paint a beautiful picture of your horse. Pricing for a Basic Portrait, an 8 inch by 10 inch professionally hand painted watercolor/guache work, starts at $650. Larger paintings and group subjects are also available upon request and prices will vary. You can now order a fine giclee print of your painting, or of select Lori's Horse Portraits paintings. I have also created a technique where I manufacture custom panels that are hand painted water color but can be framed like an oil painting. I can also permanently attach artwork to tack trunk tops - A great way to spruce up your show image! A perfect and affordable keepsake of your saddle pal, a thoughtful gift, or a tribute to a faithful friend, Horse Portraits are a lovely way to celebrate the profound beauty and strength of these incredible animals. Prices for multiple subjects are listed in Services as well as information about my Basic Portrait, shipping, emailing photos and more ways to enjoy your Horse Portrait. Don't forget to check Photo Hints for ideas about how to take the best pictures for a Horse Portrait. Or click "Contact me" to get started. For Horse Portrait News, check my blog for the latest update. All images on this site are copyrighted and owned by the artist, Any unauthorized duplication is unlawful. Prices subject to change without notice.